Home / Blinds By Room / I want blinds for my bathroom: What should I consider? I want blinds for my bathroom: What should I consider? When it comes to decorating your home, it can often be the case that a bathroom gets overlooked. This is because it is hard to accesorise and expensive to fully redesign. Yet choosing the right window blind is a change you can make that will have a big impact in terms of design and practicality. If you start to consider a bathroom and how we use it, then it should become clear that when it comes to blinds you need something that is moisture resistant, offers privacy when needed yet still lets in enough natural light. Getting this balance just right can be difficult, as certain blind fabrics that are moisture resistant may also block out light. So there are a lot of factors to consider when making a choice. Ultimately you need to consider what you need most from a bathroom blind, weighing up the benefits that mean the most to you. Usually moisture resistance and privacy are priorities, and then choosing a blind that allows natural light in is a close third. The key is getting the most for your money, and getting a blind that will meet your needs. So let's consider the available options and factors to keep in mind before making a purchase. You always need to consider light levels in a bathroom, unless you have an extravagantly large bathroom with lots of windows. Often bathroom lighting is great at night, but in the morning and throughout the day it leaves something to be desired. This is especially true if you are shaving in the bathroom mirror or your beauty routine requires additional levels of light. 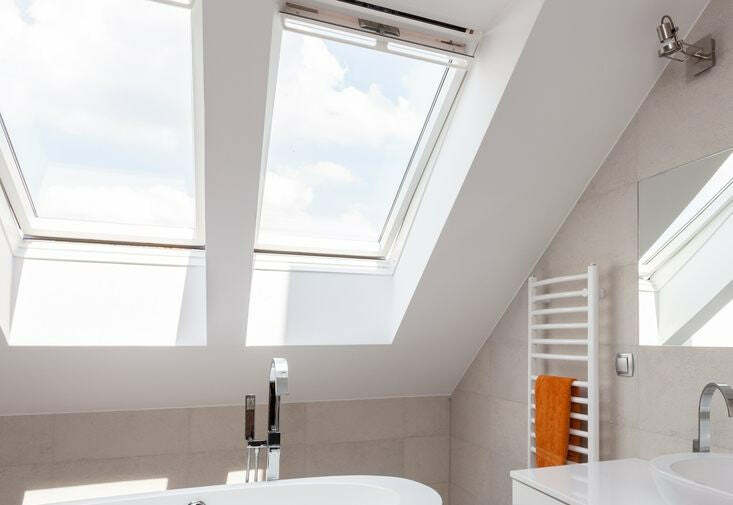 Not everyone can afford additional lighting around a bathroom mirror, so it is worth considering natural light levels when buying a bathroom blind. We will cover moisture resistant blinds below, but when you are looking at these think about whether they will block out too much light. Some of the PVC blinds are moisture resistant but unfortunately block out a lot of light. Some options are available that are both resistant to water and opaque enough to still let in light, but you will have to review the options available with each individual blind. You can go for Venetian blinds (more covered on these below) as they are available in moisture resistant aluminium or faux-wood options. They also have the added benefit of allowing you to control exactly how much light you want to enter the room, whilst still offering privacy. If light is going to be an issue then it is advisable to go for a light and bright blind colour, as this will add a touch of colour to the room and make it feel brighter and fresh. See below for more information about colour and style options. Privacy is also a major consideration for a bathroom blind, as you need to ensure that onlookers cannot see into the bathroom when you are showering or getting changed. A lot of properties have bathroom windows that are visible from the street or from adjacent properties. This is even more of a concern when a bathroom is on street level or is exposed to passersby or neighbours. 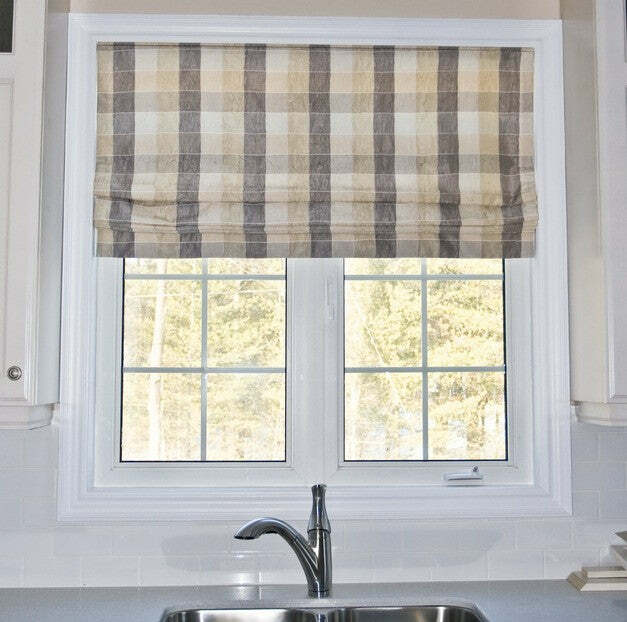 So you need to make sure you choose a blind that won't make you feel exposed within your own home. You could consider a blackout blind option, however this is going to effect the natural light levels entering the room. There are also less extreme options such as moisture resistant Venetian blinds that will allow you to control light levels, while still angling the blinds so that onlookers can't see in. Alternatively, there are certain roller blind fabrics that are semi-transparent which will allow enough light through, yet still offer the required level of privacy and moisture resistance. Basically you will have to choose a blind that has the features that best suit your needs. You can either have a blind that allows lots of light to enter the window, or you can go for a blind that offers great levels of privacy. In one respect or another you may have to compromise and instead go for a blind that offers a reasonable amount of privacy, yet unfortunately blocks out a little more light than you would initially like. It goes without saying that your bathroom is going to be moist and humid. There will be steam from a shower and bath, plus you are going to be using taps and the toilet throughout the day. All of these activities add moisture to the air, which will naturally affect a blind. This is especially true as a cold window will attract warm air within the room and condensate, adding water droplets directly on or near to your blind. So you need to bare this in mind when choosing a particular blind. You need to consider what material it is made from and whether it is resistant to moisture. The last thing you want to do is buy a blind and within a few months find that it is stained or has attracted mold. This is only going to cost you more money to replace, so it is better to make the right choice to begin with. Larger bathrooms will have better ventilation, meaning that water vapour has a larger space to spread and will therefore have less of an impact on blinds. They are better able to disperse moisture due to increased air flow and ventilation. However smaller bathrooms with little or no ventilation can act like a mini steam room. Water vapour stays trapped within the room, which in turn condensates on a cold window and can damage blind fabric. So if you have a small bathroom you need to take special care when buying a window blind. Moisture resistant blinds are almost certainly a must, but lets also consider water sources and the different fixtures you have within the bathroom. 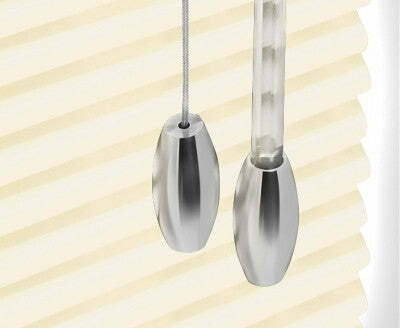 Subtle difference also impact the amount of water vapour within the bathroom and what option is best for you too. Bathrooms that have both a bath and shower are more likely to have excess water vapour within the room. Whereas if you have only of these then there is less risk of your bathroom becoming humid. Showers and baths are both particularly good at vaporising hot water and dispersing it around the room, in the form of steam. A busy bathroom, where the shower is used two or three times in the morning, is also more susceptible to moisture entering the air. This is even more evident within a small bathroom with poor ventilation or an ineffective extraction fan. Also, consider where fixtures are in relation to your window (and blind). If you have a bathtub directly beneath a window then all of the hot steam is going to evaporate directly onto your blind. Similarly if you have a sink beneath a window, then splashes of water can easily be transferred onto the window blind, and cause damage. So you need to consider what fixtures add moisture to your bathroom, where they are located in relation to the window, and how often they are used. All of these factors will effect whether you need a more durable window blind that is resistant against moisture and mold. With this in mind here are a selection of the most popular blinds for a bathroom, as well as things to keep in mind when making your choice. 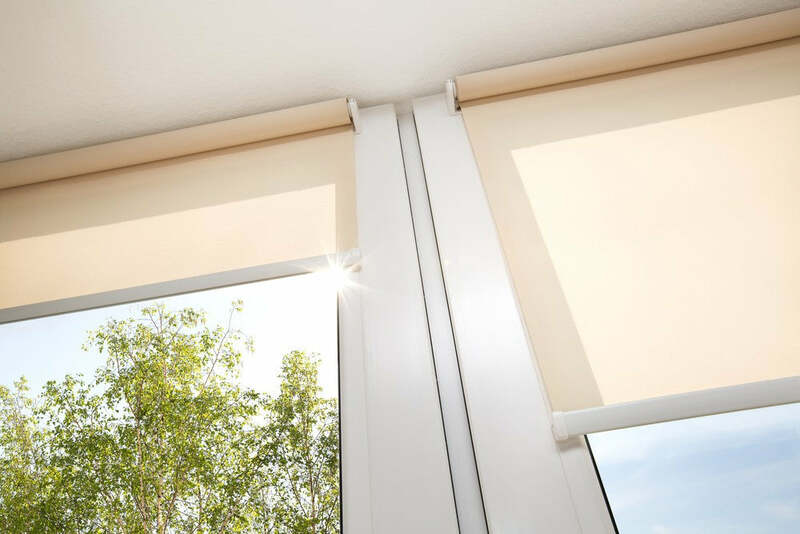 There are a variety of different blind types, all made using different types of materials. Some of these will not be suitable for a bathroom window, such as a roman blind made of normal fabric. Whereas others made from vinyl, PVC, aluminium or faux-wood are more suited to moist environments as they don't absorb water vapour and can easily be cleaned. Whereas natural or real wood blinds are not suited to a bathroom environment because they can warp and swell, other types of Venetian blinds are actually one of the most popular choices for bathrooms. In particular wood effect or aluminium Venetian blinds have the same look as real wood blinds, but they are more resilient in moist environments. Here it is important that you ensure an aluminium blind is composed purely of aluminium, without any wooden trim, etc. Only 100% aluminium blinds are suitable for bathroom windows, and check that these have plastic not steel components for adjusting the tilt and position of the slats. 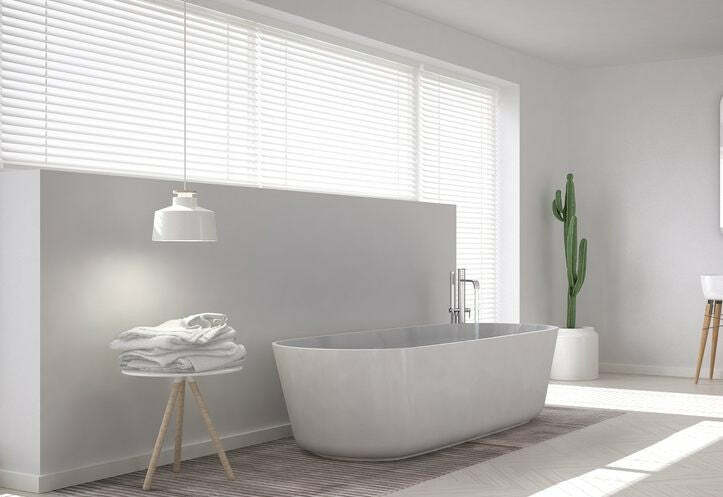 Providing a Venetian blind meets the above criteria then they really are a great option for a bathroom, as they are available in a great range of colours and finishes. Plus, they can be adjusted to offer the right level of privacy for your blind, without blocking out too much natural light. Alternatively, if you would prefer wooden blinds in the bathroom then there is now an excellent range of faux wood Venetian blinds that are constructed using PVC. These are extremely authentic, looking as close to wood as you can get, yet they won't absorb moisture or warp under varying bathroom temperatures. Plus depending on the individual blind, they are usually fire resistant and UV resistant, meaning they won't fade in direct sunlight. Overall a Venetian blind is a perfect choice for a bathroom, whether it is being fitted in a traditional home or a more modern property. Just consider what the blind is made of before making a purchase. Roller blinds are one of the more versatile blind choices for bathrooms, as they are available in a range of water resistant vinyl or PVC fabrics. Plus there is great colour and pattern choices with roller blinds, meaning they can match almost any bathroom style. These factors make roller blinds a great choice for a bathroom, just make sure any mechanisms are aluminium or plastic to avoid water damage and even rust. Roller blinds are also available in a selection of blackout fabrics, making them ideal for exposed bathrooms where privacy is a major concern. Plus they are easy to adjust and put in just the right position to provide privacy whilst also allowing natural light to enter during daylight hours. As mentioned above, roller blinds can be bought with a patterned material, meaning they come with a bigger choice of pattern and style. So you can just as easily create a clean, fresh bathroom or an elegant stylish powder room. Patterned fabrics really allow you to dress your windows and personalise them in a way that is not available with other blind types. However, also keep in mind that you will want a material that is easier to clean - this is particularly important for busy bathrooms, or bathrooms that are especially moist and humid. If you are concerned about moisture damage then we suggest going for a water resistant material such as those available with uPVC pr PVC blinds. Although not needed for ventilated bathrooms, these are a great choice for humid bathrooms, where you are particularly concerned about water damaging a window blind. These blinds are just as versatile as other materials, available in a host of different patterns and with blackout options available too. When you think of bathroom blinds you might overlook vertical blinds, as most people go for a Venetian or roller option. However, nowadays a lot of vertical blinds are made from moisture resistant PVC fabrics, making them just as suitable as the other blind options mentioned above. As well as being resistant to moisture they can be opened or tilted to let in natural daylight, yet still offer privacy. Tilting open at the right angle will let in light, whilst providing privacy from adjacent properties. Vertical blinds are also available in a range of colours, meaning they can suit most bathroom styles and colour schemes. 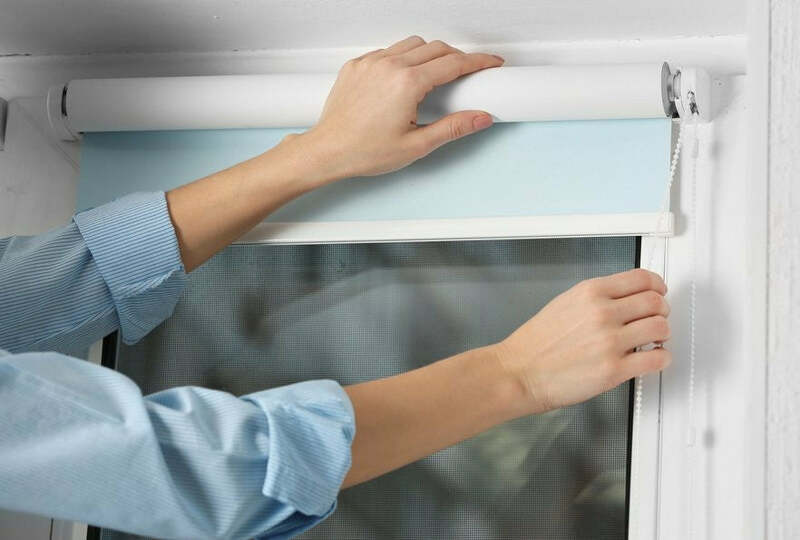 Lastly, if a blind slat becomes damaged then they are much easier to replace than with Venetian blinds, so you can make a replacement without any major issues. All of these factors mean that some vertical blinds are becoming more and more popular in bathrooms. All of the above options are water or moisture resistant, so when it comes to blinds to avoid it is clear that you shouldn't go for blinds that are easily susceptible to water damage. This mainly means you should avoid real wood blinds, blinds made using heavy fabrics, and blinds made using fabrics that are not water-resistant, such as most types of roman blinds. All of these blind types just aren't suitable for a bathroom or wet room, as they will inevitably succumb to water damage, become damp, grow mildew and then start to smell and become discoloured. Note: Even if you think your bathroom is heavily ventilated and not particularly humid, you should still avoid the blind types mentioned above. Bathrooms are naturally moist and water vapour will inevitably find its way onto a blind. So unless unavoidable, water-resistant blinds are a better choice, as otherwise your blind won't last very long and will just have to be replaced later down the line. All bathrooms are susceptible to moisture, so we don't advise going for a blind with little or no protection against water. However depending on how the bathroom is used, what fixtures it has and the location of these from the window; it may be possible to go with a blind that is more suitable to a living room, dining room or bedroom. This isn't something we would initially advise but if you really don't like roller or Venetian blinds then another blind type may be a more preferable choice. If you are not restricted by PVC moisture resistant fabrics, then you can choose a number of other materials for your roller or Venetian blind. This gives you greater choice and allows you to get the exact look you want. Alternatively, you could go for a roman blind provided that the bathroom is heavily ventilated and less susceptible to moisture. Roman blinds can help you to get a luxurious look within the bathroom, creating an elegant and timeless look. They also give you a lot more choice, as there is a host of different roman blind fabrics to choose from. Lastly, wooden Venetian blinds could also be consider in low-moisture bathrooms as they offer privacy, can be tilted to let in more light and are available in a number of different wood types. Note: We must stress that we don't advise using roman blinds, wooden Venetians or fabrics that aren't moisture resistant. Even in a heavily ventilated large bathroom, there is still going to be moisture in the air, which could potentially damage window blind fabric. So if you go for this option then be aware of the risks and that any moisture could cause your blinds to get damp and grow mold, seriously affecting their lifespan. Now that we have considered the practical requirements of a bathroom blind, lets think about style and colour options. An obvious choice for a bathroom blind is blue, mainly because of it's association with water. This choice can create a fresh and clean look within a bathroom, but it won't go with all tile and paint colours. Alternatively, you may want to go with natural shades that you won't tire of, such as soft creams, whites, browns and beige's - these really are safe colour choices as they are neutral tones that will compliment most bathroom colours. You may also consider going for a bold choice, to create a focal point for the bathroom and to add a touch of energy and creativity to the room. Let's talk patterns. As mentioned above, modern roller blinds are available in a host of different patterns. This means you have a lot more options when it comes to PVC fabrics, and can actually choose a unique, stylish and elegant design that speaks to you rather than going for a plain blind. You can therefore choose a blind that better suits your personal taste or that compliments your bathroom colour scheme. Simply adding a floral blind can add a touch of personality to a bathroom, or going for a striped blind that matches a few colours tones from the bathroom can really help to set it off within the space. As mentioned above, there is a lot of different blind types, colours, and patterns you can go for within a bathroom. However, before you make your choice just keep in mind the levels of moisture within the bathroom. Even heavily ventilated rooms will still get moist and humid, so you should never overlook the need for moisture-resistant blinds. Consider where the blind will go within the bathroom in relation to the bath, shower and sink. Afterwards you can get to the fun part, and start to consider styles and colours.